The Old Supreme Court Chamber is the first room constructed for the use of the nation's highest judiciary body and was used by the Court from 1810 until 1860. Built by Benjamin Henry Latrobe, it was a significant architectural achievement, for the size and structure of its vaulted, semicircular ceiling were virtually unprecedented in the United States. In addition to housing the Supreme Court, this space later served as a committee room, a law library, a meeting room, and a storage room. Today, it has been restored to its mid–19th-century appearance. A masterpiece of architecture and engineering, the Old Supreme Court Chamber in the U.S. Capitol was designed by Benjamin Henry Latrobe and built as part of his north wing reconstruction in 1808-1810. The unusual ceiling is formed by nine lobed vaults held by stone ribs supported by heavy brick piers and a three-bay arcade built parallel to the old east wall. The new masonry ceiling did not impose any additional weight or put new lateral pressure on the old walls and thus was supported independently of the old work. It was daring to attempt such a ceiling over a one-story room and clever for not using the old walls for support. It is one of Latrobe's most admired achievements. The Supreme Court first met in this chamber in 1810 with Chief Justice John Marshall presiding. In 1860 the Court moved upstairs into the former Senate Chamber and this room was converted into the law library. After the Court left the Capitol in 1935 this chamber was divided into four rooms and used by the Joint Committee on Atomic Energy. In the 1960s the chamber had been abandoned and stood vacant until restored in 1975. Entrance to the chamber is gained through the robing room at its southern end. 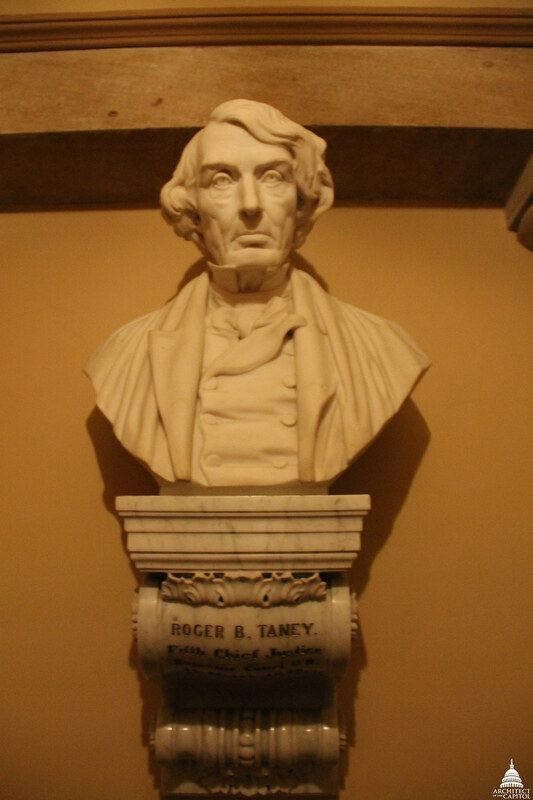 In this room is displayed a bust of Roger B. Taney, the nation's fifth chief justice, who held the post from 1836 to 1864. 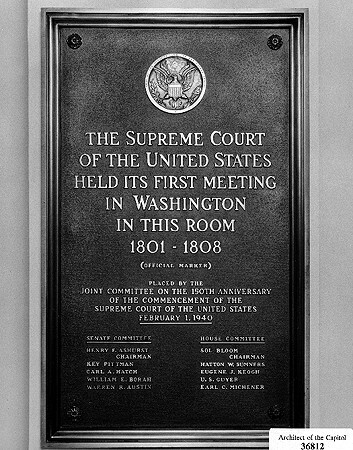 The coat hooks on the wall opposite the bust carry the names of the justices on the Supreme Court from 1858 to 1860 (the label "Chief" indicates Chief Justice Taney). The chamber is semicircular and measures 74 feet 8 inches wide and 50 feet deep. Its vaulted ceiling is divided into lobes by 10 ribs. The windows on the eastern wall originally looked out on the Capitol Plaza; because the mid 20th-century extension of the Capitol's east front blocked the windows, they are now artificially lighted. Displayed at the rear of the room are busts of the first four chief justices. From south to north, they are John Marshall, John Rutledge, John Jay and Oliver Ellsworth. Over the west fireplace hangs a clock ordered for the chamber by Chief Justice Taney in 1837. Above the clock is a plaster relief sculpted in 1817 by Carlo Franzoni. The central figure in the relief is Justice, who is seated and holds a pair of scales in her left hand; her right rests upon the hilt of an unsheathed sword. Unlike many depictions of Justice, she wears no blindfold. The winged youth seated beside her is Fame, who holds up the Constitution of the United States under the rays of the rising sun. At the right side of the sculpture, an eagle protectively rests one foot upon books containing the written laws. In front of the eastern arcade are mahogany desks for the nine Supreme Court justices, set off from the rest of the room by a mahogany railing. Seven of these desks are 19th-century originals, believed to have been purchased for the court in the late 1830s. The chairs behind the desks represent various styles used around the year 1860; each justice selected the style of his own chair. Desks at either end of the row of justices' desks were used by court officials. On the justices' right sat the Attorney General and the clerk and deputy clerk of the Supreme Court. On the justices' left sat the court reporter, the marshal, and the deputy marshal. The floor in the central area of the chamber is approximately 1 foot lower than the level upon which the justices' desks are placed. In this area stand four baize-covered mahogany tables used by lawyers presenting cases before the Supreme Court. Facing these tables and lining the area's western end are the wooden panel-back settees provided for the audience. In November 1806 Benjamin Henry Latrobe, the Surveyor of the Public Buildings, prepared plans for rebuilding the interior of the U.S. Capitol's north wing. Although occupied for only six years, this wing suffered from falling plaster, rotting floors and a leaking roof. So poor was the original construction that, rather than making repairs, Latrobe wished to completely rebuild the interior within the existing brick and sandstone walls. An initial appropriation of $25,000 began the work, which was focused on the eastern half of the wing. Latrobe demolished the two-story Senate Chamber and the large, unfinished room above it as well as adjacent lobbies and offices. With the space cleared of all previous, inferior work, Latrobe began to rebuild it with solid, fireproof masonry vaulting. A significant element of Latrobe's plan was a one-story room on the ground floor intended to be used by the Supreme Court. The accommodation of the court in the Capitol had always been considered a temporary arrangement. Since 1801 the court had met in a committee room (now numbered S-146 and S-146A), while a separate building for its use was believed to be forthcoming. Latrobe could not know that the Supreme Court would continue to share quarters with the legislative branch until 1935. Latrobe's reconstruction of the north wing faced serious architectural and engineering challenges, especially the need to create a vaulted chamber that imposed no structural loads upon the existing walls. His solution to this problem was both effective and elegant. Parallel to the east wall he constructed a deep three-bay arcade carried on sandstone Doric columns modeled on those of the Temple of Poseidon (the shortest, and thus the strongest, columns that survive from classical Greece). He also built a semicircular arcade several feet away from the old western wall. These stout new supporting piers carried the room's most dramatic feature: a lobed, vaulted ceiling that has often been likened to an umbrella or a pumpkin. This construction technique, which is similar to medieval practice, reduced the old walls to mere screens. Regrettably, this impressive engineering feat cost the life of Latrobe's chief assistant. During construction the vault was supported upon a wooden centering built by John Lenthall, the Clerk of the Works. When Lenthall attempted to remove the centering prematurely, the vault collapsed, crushing him under its weight. Latrobe's reputation was severely damaged by this accident, but he persevered in his efforts to make the Old Supreme Court Chamber both beautiful and durable. Some measure of his success may be seen in the fact that the chamber survived the efforts of British troops to burn it on August 24, 1814. For the sake of safety, however, Latrobe dismantled the vault and built it for the third and last time as part of the repairs to the Capitol that he began in 1815. After Latrobe's resignation in 1817, work on the chamber continued under architect Charles Bulfinch. Bulfinch was able to complete it in time for the court session that began in February 1819. For the next 41 years, the Supreme Court met in this chamber. During that time numerous landmark decisions were handed down from the bench, including Trustees of Dartmouth College v. Woodward, Gibbons v. Ogden, and Dred Scott v. Sandford. In 1860 the court moved upstairs into the room vacated by the Senate. The Old Supreme Court Chamber was then used as a law library. An 1898 gas explosion in the sub-basement southwest of the chamber, and the ensuing fire, inflicted some damage on the floors, furnishings, and books in the library. The Supreme Court vacated the Capitol in 1935, and the room was used for a reference library until the 1940s. From 1955 to 1960 the chamber was assigned to the Joint Committee on Atomic Energy. It was next converted to a storeroom, and it served this purpose until Congress voted for its restoration in 1972. Extensive research and planning preceded the restoration. An 1854 diagram was discovered that proved invaluable in establishing the architectural layout and furniture arrangement of the room. A portrait depicting Chief Justice Marshall seated in the chamber provided visual documentation for the re-creation of the carpet and the mahogany rails. A descendant of the Clerk of the Court provided Chief Justice Taney's desk and the original marshal's desk. The Supreme Court and the Senate Sergeant at Arms transferred cabinets, chairs, desks, and other items formerly used by the Court. Original fixtures and furnishings that could not be located were replicated according to the best available historical evidence. After years of painstaking work, the restored chamber was opened to the public in May 1975. Today it is used primarily as a museum, recreating the scene of many significant moments in the evolution of the United States Supreme Court and the judicial history of the nation.